“Baby, it’s cold outside.” I realize by this time of year that line has been overplayed on the radio and is as old and tired as your handmade ugly Christmas sweater. Here in Los Angeles, the temperatures have dropped below flip flops and shorts weather and in our home, that means warming up the kitchen with restorative winter soups. One of the most popular Mexican soups is Albondigas, a clear broth typically made with meatballs of ground beef, white rice, along with squash, carrots, onions and other vegetables. All the holiday tamales got the best of me and Stephen and so we are revisiting traditional recipes and swapping out some of the fatty or carb-laden ingredients for healthier ones. It’s a challenge because we refuse to sacrifice taste. 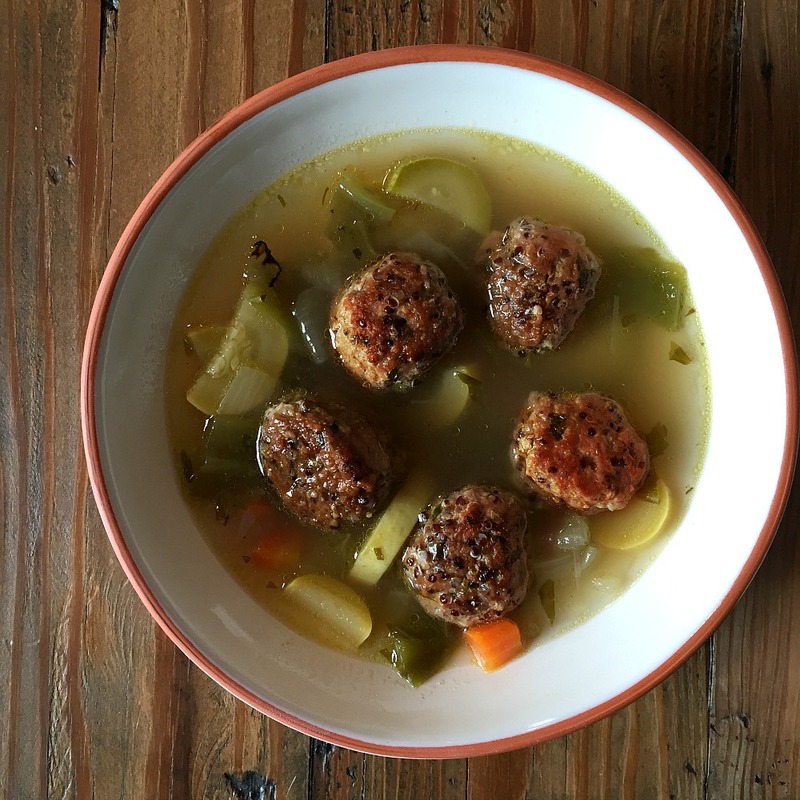 This Albondigas soup recipe is made with ground turkey. It’s much leaner than ground beef and who needs the white rice that is folded into the meat mixture to make the meatball? Instead, we used nutrient dense red quinoa. Red quinoa is rich in essential minerals and vitamins and is gluten-free. I added chopped mint and serrano peppers to amp up the flavor factor. 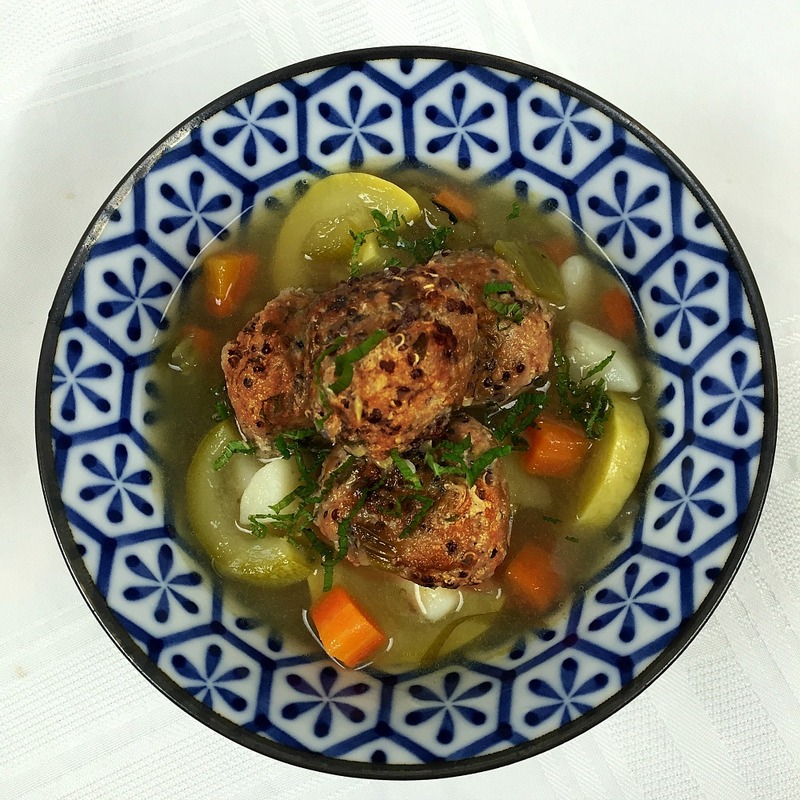 And, used low-sodium chicken broth with a splash of apple cider vinegar. Like the mint, the vinegar subtly brightens and freshens the soup. 1. In a large bowl, mix all the ingredients (except the cooking oil) until just combined. 3. Chill the tray of meatballs until you are ready to cook them, about 15 minutes. 4. To cook the meatballs, heat about 1 tablespoon of cooking oil in a large skillet over medium-high heat. Begin browning the turkey meatballs, making sure they brown evenly on all sides. It’s best to work in batches, and to wipe down the skillet with a paper towel between batches. Each batch should take about 5 minutes for meatballs this size. Allow the cooked meatballs to drain on a paper towel and reserve. 1. Rub the Anaheim peppers with 1 1/2 teaspoons cooking oil. Char the peppers over an open flame like your stove or a grill. Carefully turn the peppers with tongs, making sure they blister and blacken evenly. Place in a plastic bag, seal it, and allow it to steam for 10 minutes. Then rinse off under cold, running water. Discard the stems and seeds. Dice the peppers and reserve. 2. In a large stockpot (8 quarts was used for this recipe) heat the remaining 1 1/2 teaspoons of oil over medium-high heat. Begin sautéing the celery, carrots and onion until they soften and the onion just starts to become translucent, about 3 minutes. 3. Stir in the garlic and cook for about 1 minute. It should be fragrant but make sure it doesn’t burn. 4. Stir in the squash and reserved diced Anaheim peppers. Allow to cook for about one minute. 5. Add the potatoes, broth and water. Cover the pot and raise the heat to high and bring to a boil. 6. Once it is at a boil, reduce the flame to a simmer. 7. Gently add the meatballs to the simmering pot and allow to cook just until the potatoes are cooked through, about 5 minutes more. 8. Season to taste with kosher salt and ground black peppers. Right before serving, gently stir in the apple cider vinegar. 9. Serve hot, garnished with fresh chopped mint, lime wedges and/or sliced radishes.